As we headed farther north we came to the realization that we are chasing spring. We experienced spring in Holland with the tulips and lilacs and then again in Monroe and Farmington at the end of the lilacs and dandelions. When we hit Grayling we found the dandelions almost gone and now that we are in the U.P. (Upper Peninsular) we are seeing the start of lilacs and dandelions all over again and even a few tulips. longest in the western hemisphere. To get to the U.P., you of course have to cross the mighty Big Mac Bridge. While, Nancy admires all the splendor of the bridge she is not in general a fan of bridges. So, crossing this in our big rig, with the view point of her passenger seat was making her a little nervous. When we arrived at the bridge we discovered only one lane was open due to road construction - shocking that there is road construction in Michigan. Nancy was thrilled to find that the outside lane was closed and not the inside one. This made crossing so much easier. Lucky for us there was very little wind and it was a beautiful day. Nancy took lots of picture to distract herself and she did just fine. Once we were safely across the bridge we headed to Kritter's Northcountry Campground. It is a small privately owned campground in Newberry. The new owners Larry and Kathy have just purchased it, in fact just closed on the sale in March. They were tired of corporate life and never getting a chance to see their young daughter grow. It was fun watching Larry do work around the grounds with his daughter tagging along and chatting up a storm. The grounds are well maintained, they have WiFi, but like most places it is not very strong, they also offer cable for an extra $2 a day, we didn't use it so don't know how well it worked but a nice offer anyways. They are centrally located and close to many local attractions, which of course we took advantage of. They have a lodge, cabins and an RV to rent as well as regular sites, and they plan to be open all winter for the snowmobilers. The only draw back was the unbelievable amount of mosquitoes - which of course they have no control over. 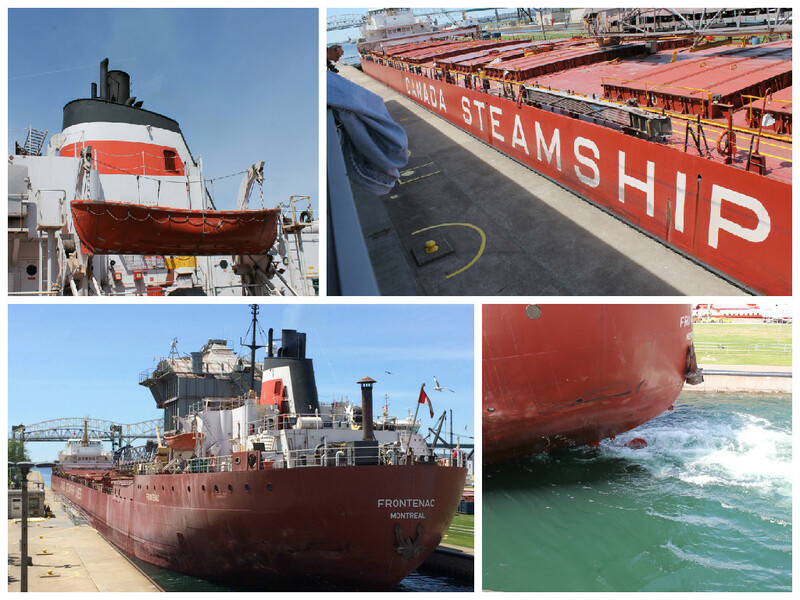 We have both been to the Soo Locks many times before, but it is just too cool not to go see. We got there just in time to see one boat being raised to head into Lake Superior and one being lowered to head into Lake Huron. Both freighters were Canadian Lines. It is just amazing how they can get into that narrow channel and out again. It takes such a short time to accomplish. After the one freighter pulled out to Lake Superior a small tour boat was waiting to head in. It was such a contrast in size. The locks, which are 1.6 miles long, are located on the St. Mary's River and they bypass the rapids of the river, where the water falls 21 feet. They share a name with the two cities named Sault Ste. Marie (shortened and anglicized as Soo) in Ontario and Michigan, located on either side of the St. Mary's River. There is also an international bridge for vehicular traffic. We stopped at the St. Irocroe Lighthouse on the way to White Fish. 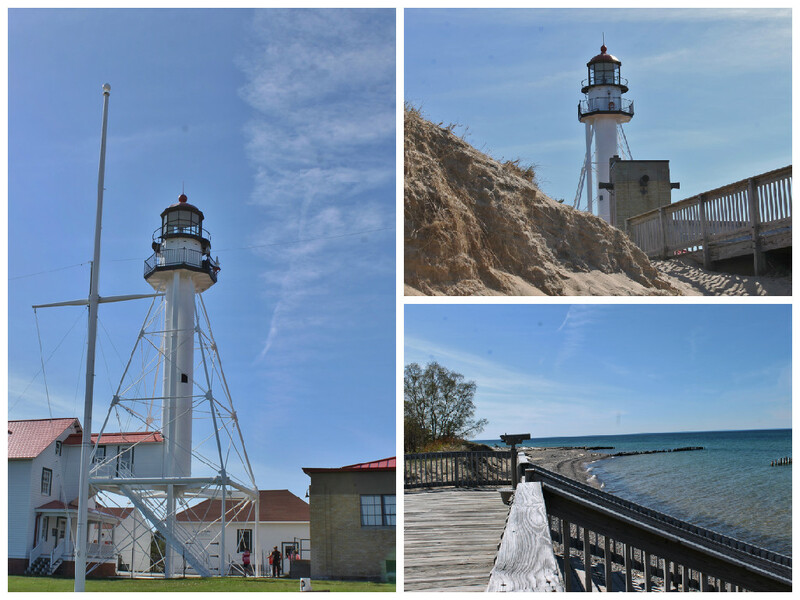 The lighthouse keeper reminded us of a typical Yooper. It was great fun talking with him. Nancy tried to climb the stairs to the top but only got about half way, she has made it to the top of two others, but just wasn't brave enough this time. Or maybe it was the horrible summer cold and sore throat she has that stopped her - that's the story she is sticking to. they are trying to get a position in North Carolina next - hmmm maybe our next adventure? When we got to White Fish Point we found out it would cost us $30 to get into the buildings and lighthouse, seeing we have done it before we decided to save the money and just explore outside. We did get to go out on the observation deck and walk along the beach which we loved. 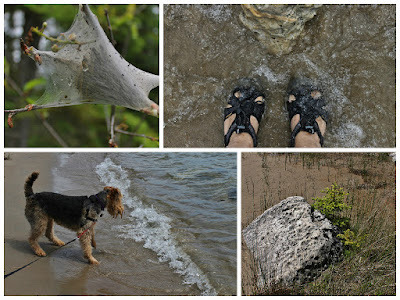 Nancy got her feet into Lake Superior and found another rock for her collection. We started this day with breakfast at Pickleman's. Well, Nancy had lunch and her first U.P. pasty. It was good, but not quite up to her standards, it would have been better if they hadn't microwaved it, which made the crust spongy. We ended our long first day with dinner at the Tahquamenon Falls Brewery. It is located in the Tehquamenon State Park at Barrett Camp 33. Both Les and Nancy had pasties, these were much better than the earlier one, but still no rutabaga. The beer was good. The Brewery is beautiful, large wooden beam ceilings and lots of nature as art. The current owners grandparents, Jack and Mimi Barrett's (no relation to us) favorite thing to do was to canoe and camp as they traveled from their home in Newberry to the falls. They loved the area so much they purchased the land adjacent to the falls. Jack dreamed of a time when the falls and forest could be experienced by everyone. In the mid 20th century, you could only get to the falls by boat. Jack orchestrated the construction of a road to the site then negotiated with the DNR for the gift of his land to be used specifically for a State Park. A restriction in the deed directed that the road and parking lot would terminate 3/4 of a mile from the falls and that visitors would proceed on foot, thus preserving the parks natural beauty. The name "Camp 33" came from the names given to logging camps and this was the 33rd logging camp of the Barrett Logging Company. In 1950 a replica of a camp was constructed on this site to serve the public as an eating and resting place. In 1990 his grandchildren rebuilt Camp 33 and dedicated the structure to the man whose foresight and philanthropy made possible the experience we all enjoy today. The brewery opened in 1996 and in keeping with the founders vision the focal point is the fire, a logging camp must. On the way to White Fish Point we came across a few roadside oddities. First was a replica of a freighter floating in a small lake and a replica of the St. Irocroe Lighthouse on the shore. We also found a bowling ball tree and a shoe tree. While getting a picture of the bowling ball tree we shopped at the yard sale they were having. The lady there had a bee keeper's hat on because the mosquito's were so bad. We woke up on our second day to rain, fog and clouds. A little bad weather can't keep us down. 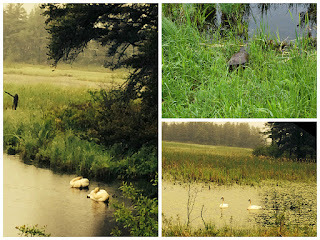 We went to the Seney Wildlife Nature Refuge as we could pretty much stay in the car. 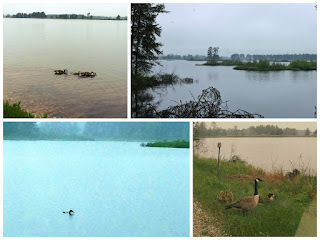 It is a beautiful drive along 7 miles of winding road through wetlands and forests, with observation decks to stop at. 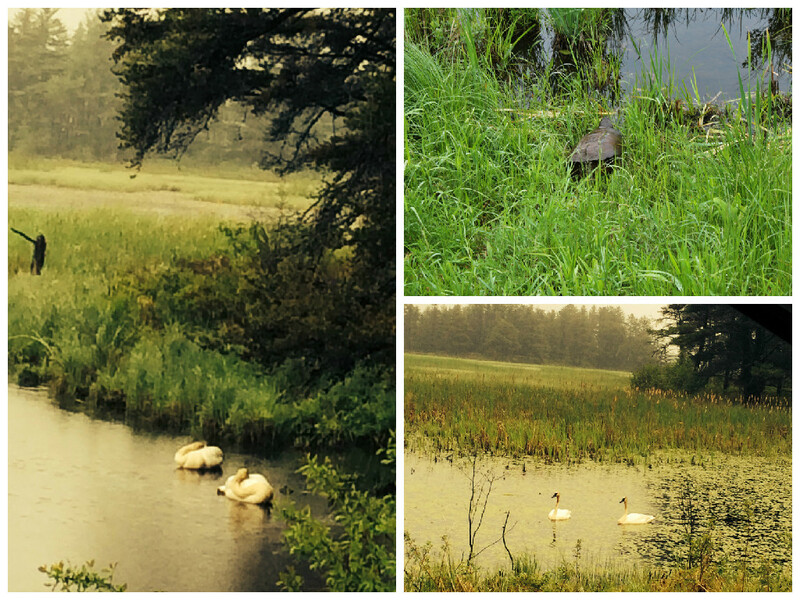 Seney was established in 1935 and encompasses 95,238 acres of swamps, bogs and forests, which are habitats for over 200 species of birds. We came here with Katrina when she was in high school and we saw a guy jogging and he had flesh colored shorts on and at first glance we thought he was naked - so the phrase naked man running became a joke in our house! 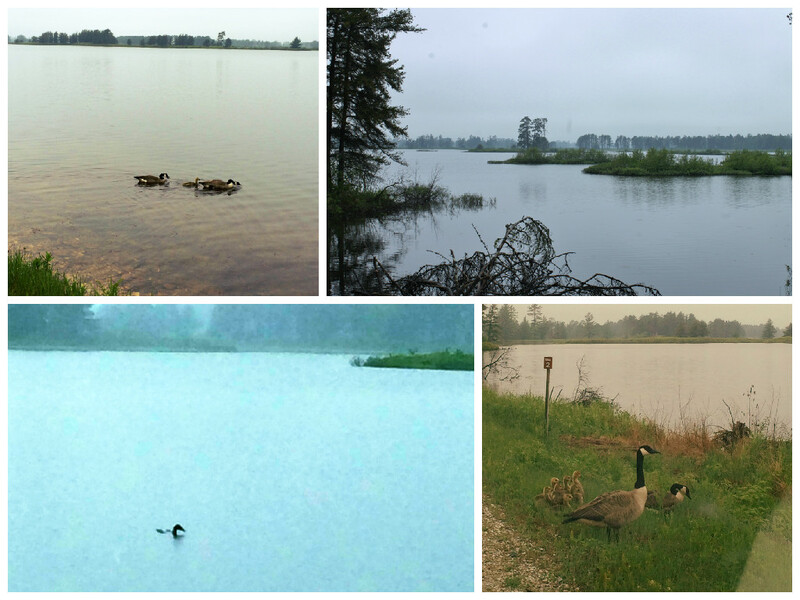 No naked men this time - but we did see snapping turtles, loons, geese, swans, muskrats, red winged black birds, egrets and chipmunks. A little bit of fog. Once again we woke to a rainy, dreary day. As we headed east on Hwy 2 we wondered if the day would be a wash out, or a fog out, but the closer we got to Drummond Island the nicer it got and it turned out to be gorgeous. 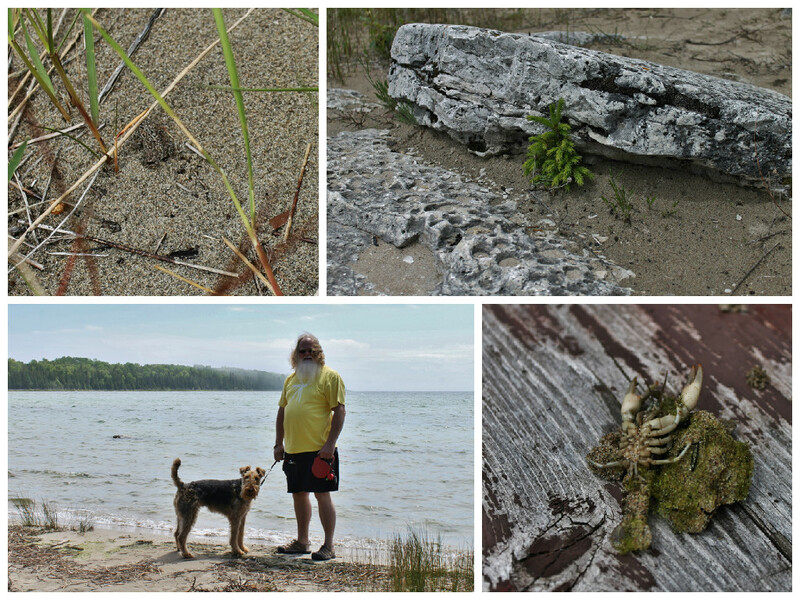 Neither of us had ever been to Drummond Island before. The last time we were in this area we missed the ferry. This time we pulled into De Tour just in time to drive on before they took off. The ferry ride is very short but fun to do. Les chatted with an older gentleman who was wandering around the cars, while Nancy stood up through the sunroof to take pictures. Once on the island we headed out to explore. Our first sighting was a very large rocking chair along side someones driveway. We stopped at Big Shoal Bay Beach, just a small patch of public beach nestled between private beaches. There was still a little fog out over the water and the beach was a mixture of sand and large rocks. The rocks looked like they came from the moon. We chased a small frog - he wasn't feeling very photogenic but you might spot him in the picture. 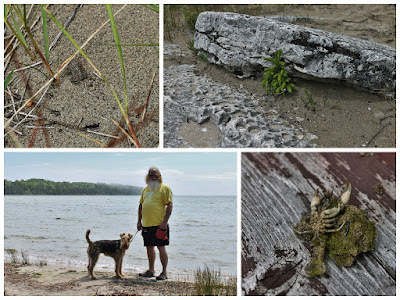 We found a tiny little skeleton - not sure what it is, looks like a miniature lobster! Mielikki had a blast trying to catch the waves. In the parking lot Nancy found an interesting nest full of caterpillars. Nancy got her feet into the Huron River. We stopped for coffee on our way back to the ferry and the place we stopped at served Zingerman's coffee! Ann Arbor coffee on Drummond Island. They also had a large wooden boat in their yard. Just before getting on the ferry we stopped for a picnic dinner at the Drummond Island Township Park, they have a number of camping sites and a small beach, where we had a beautiful view while eating. While waiting for the ferry we got to watch two freighters pass by. One heading north and one heading south. and the dark spot next to that is the other freighter. Nancy has always had a love affair with Smokey the Bear. Her sister Linda had a small stuffed Smokey Bear when they were little and Nancy bit the nose off of its plastic face, something Linda has never let her forget. It was fun seeing these all over the U.P. ~ When it is time to fill your propane tank - check prices. We found a range of prices from $1.43 to $3.85 a gallon. That's a big difference. ~ Make sure you have lots of bug spray and spray or fogger for your site. We encountered even more Mosquitos than we over thought we would. Surrounded by 40 or 50 at a time. ~ Grocery shop before leaving one place and heading to the next. You never know if the next place will have a store close or not and you can find yourself with no milk, eggs, coffee cream or other breakfast essentials the first morning.